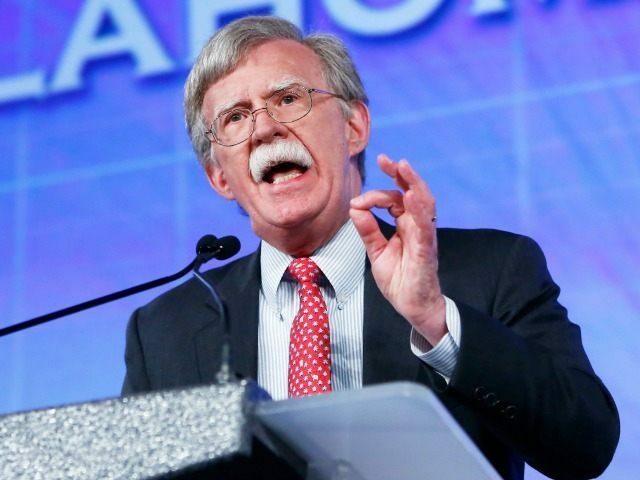 NEW YORK, NY—Former United States Ambassador to the United Nations and senior fellow at the American Enterprise Institute, John Bolton, says he thinks President Donald Trump should de-certify the Iran nuclear deal prior to the October 15 deadline. “I think the president should decertify. I think he should withdraw from the deal entirely,” Bolton told Breitbart News in an exclusive interview outside Dag Hammarskjöld Plaza during the United Nations General Assembly last week. “I think it was a disastrous agreement for the United States to make; harmful to the United States, harmful to its friends and allies, harmful to the people of Iran. The sooner we get out of it, the better,” Bolton said. Bolton conducted the interview during a September 20 rally coordinated by the Organization of Iranian-American Communities (OIAC), and members of the Mujahedin-e Khalq (MEK), against the visit of Iranian President Hassan Rouhani in New York. President Trump told reporters last week he has “decided” on a plan of action, but he has not provided specific details. Although he has twice recertified the Iran nuclear deal, his strong speech at the UNGA last week seems to signal he will not recertify next month. Last month, Bolton penned an article in National Review, detailing the plan he drafted, at the behest of former Trump chief strategist Steve Bannon, to exit former President Barack Obama’s failed nuclear deal with Iran.